Killer bees, or Africanized bees, are aggressive insects that have been known to chase a person or an animal up to a quarter of a mile. The following facts demonstrate the fierce quality of these bees that continue to move ever northward and to both fascinate and alarm people. Bees live in every region of the earth-except near the North and South poles. Africanized bees did not migrate from Africa, but rather, originated in Brazil. 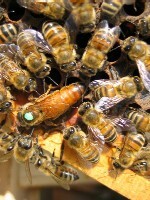 They are a hybrid crossing gentle European honeybees with hardy African bees. Scientists in Brazil were looking to make a hardier bee for better honey production; instead, the result was the aggressive hybrid known today as killer bees. These bees might not have seen the light of day but for an accident resulting in a release from the science laboratories. Immediately, they took over the local hives and continued to breeze resulting in today’s aggressive swarms. Africanized bees look quite similar to European bees; experts must examine upwards of twenty body parts to determine which bee they are dealing with. Africanized bees have the same stinger as European bees-same amount of venom. However, killer bees are easily provoked and attack in army fashion-this is where their danger lies. It takes a European roughly thirty seconds to sting; a killer bee can manage the task in about three seconds. A single sting by an Africanized bee can set off an alarm to other bees provoking hundreds and eventually thousands or stings if the victim does not get away. The alarm is an odor similar to the smell of ripe bananas. Africanized bees are ill at ease near people and animals. A sound or a strong perfume can easily set them swarming. Scientists do not believe that killer bees are simply “mean;” they are more sensitive and more prone to defend their hives; they feel threatened quite easily. Africanized bees produce five times less honey than the more docile European bees. A single colony of killer bees is likely to include 80,000 members. The bees are now in such U.S. states as California, New Mexico, Arizona, Nevada and of course Texas. Mexico has them as well. As more bees breed there are increasing attacks on humans. One tip might be to never remove a colony near your home-call a bee removal service. Bees tend to attack outdoors, but occasionally they invade houses-usually when they are swarming to find a new home. If you live in areas where killer bees are known to live, avoid low-hanging branches. Be careful of holes in the ground; killer bees also build nests in such holes. Most people can outrun bees-but run in a straight line and be prepared to run past that quarter mile mark. Never think you can fight them off. Cover your face which is a prime target for the bees. Fun Facts About Orcas: The Killer Whale!